You might have walked through the streets of Barcelona, delighted with its fantastic views, its gorgeous buildings and its magnificent Arquitecture. Today, though, we present you this colourful work you might have failed to notice. 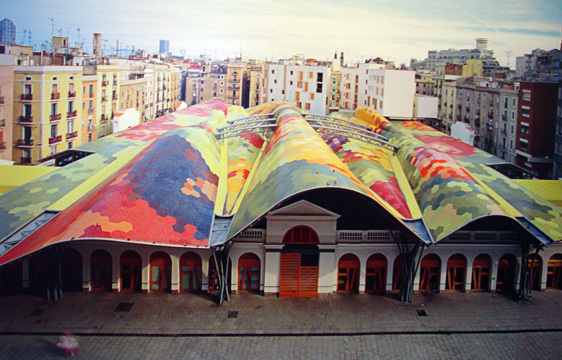 Santa Caterina Market in Barcelona, where Enric Miralles and Benedetta Tagliabue of EMBT Miralles Tagliabue Arquitects Associats created a huge, undulating canopy for an existing, neo-classical-style market building in a large square in 2005. The canopy consists of a mosaic of 325,000 hexagonal brick tiles "whose various colors recall a sill life of produce," according to the exhibition's catalogue, which also noted that "an elevator will be completed in the coming year to bring visitors up from market level."